alaska storage Archives - Best Self Storage in Anchorage! Best Self Storage in Anchorage! Welcome to Best Storage where we provide safe, friendly and affordable storage in a clean and secure environment. Best Storage Alaska facilities offer special options for their customers to suit individual storage needs. Special packages include the Stress Free Package, Cost Saver Package, Military Package, and Business Package. Read more for information about each special package offered to find out what best suits your storage needs. Moving can be a stressful time. But, storage may help with the stress by allowing you a safe place to hold your belongings. Drop by one of our six convenient locations and we can help you pick the size and kind of unit that best suits your storage needs. Or, to make things even easier, we can bring the rental agreement to your home. Plus, renting with Best Storage Alaska facilities includes a one time use of their truck and driver. That’s right, the driver will bring your things to a unit that’s just right for you! Speaking of stress free… need a ride to or from the airport? No problem, just let us know and we’ll arrange it for you. Why pay for more space than you really need? Best Storage Alaska facilities offer the largest selection of heated and unheated units in Alaska. Save money by selecting the unit that best suits your storage needs and budget. You can also avoid the cost of renting a rental or moving truck and driver. Hence because it’s included with Best Storage Alaska facilities. Did we mention that just $29.95 covers your first month’s rent and moves you in?! This includes any size unit, whether heated or unheated. And if you’re concerned about hidden costs and fees, don’t be. There are none! No administration fees, sign-up fees, or security deposits required with Best Storage Alaska facilities. Plus, when you’re ready to move out, we’ll refund any unused rent. With six facilities and the largest selection of units in Alaska, we can offer, day in and day out, the best price for a comparable unit. Best Storage Alaska facilities even guarantee your satisfaction. If you are not fully satisfied after 30 days, we’ll refund your money. Best Storage Alaska Facilities are designed with military families in mind. Not only do we offer military discounts, but our facility is located just two blocks from the Elmendorf Gate. Making storage a convenient and favorite choice for our valued military service members. Units are ultra clean and provide only the best security options. Our facilities also offer High Security Vehicle Storage. Receiving freight and putting it in your unit. Phone, fax, and internet service. Heated, unheated, & vehicle storage. Secure your records in your own room. Access your records directly or use our retrieval and delivery service. Best Self Storage in Anchorage Alaska Has Openings! 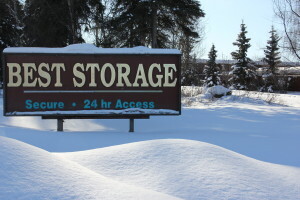 Searching for the Best Alaska Self Storage Anchorage?